A prolific burglar who was caught red-handed outside his victim's home has been jailed for four-and-a-half years. 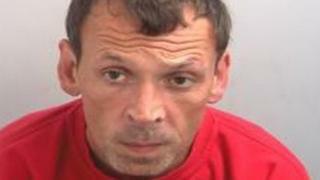 Darren Boylan, of Goodmayes Lane in Ilford, admitted burgling the house in Coggeshall Road, Kelvedon, on 5 September. The 48-year-old was caught by police after a neighbour saw him and raised the alarm. Boylan had 28 stolen items in his possession when he was stopped by officers outside the property. The thief admitted carrying out a further seven burglaries in Billericay, Kelvedon, Shenfied and South Woodham Ferrers between June and September of this year. Det Con Chris Sedgwick described the defendant, who was sentenced at Chelmsford Crown Court, as a "prolific burglar with no respect for his victim's property". He added: "It is galling that he has no qualms about forcing his way into someone's house and taking items which have great monetary and sentimental value. "The break-in at Coggeshall Road in September was a brazen attempt to burgle a house in the middle of the day. "Thanks to the quick actions of the victim's neighbour and our officers, we caught Boylan red-handed leaving him with little option but to admit to his crime."